It’s In The Bag For Jutexpo South West. Cornish company chosen for Charity Goods fundraising. Local business Jutexpo South West is pleased to announce support for Charity Goods, a company dedicated to fundraising for BBC Children in Need. The company produced environmentally-friendly jute bags with the ‘I am a TOG’ logo ready for their first sales outing at the recent TOG’s Guatemala Convention at Leicester University. 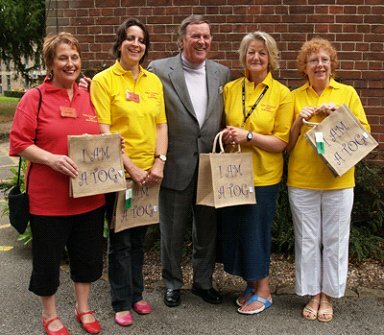 TOGs (Terry’s Old Geezers or Gals) is an affectionate name given to the listeners and contributors to the Radio2 breakfast show presented by Sir Terry Wogan. Proceeds from the sale of each bag will benefit the BBC Children in Need Appeal, whose mission is to positively change the lives of disadvantaged children and young people in the UK. Richard is a well-known local environmental spokesman and Cornwall’s popular “green ambassador”. He enjoyed a long career in the recycling and waste management sector before setting up the business with his wife Lesley earlier this year. Charity Goods evolved from the voluntary organisation set up as TOGs Calendar in 2001. So far Norman Macintosh and his wife Hellen have raised over £3 million for the BBC Children in Need Appeal.